I will admit that I only watched the TV show in passing and when this movie was first announced, it sounded like such a bad idea and I was confident in my decision to not watch it. Then they started casting it and I had to admit that their lead choices were pretty stellar. 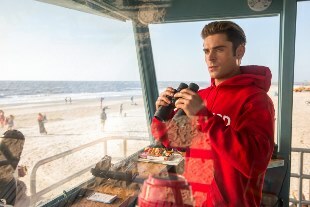 I don’t think you can do much better than Zac Efron as a really dumb, but really confident pretty boy lifeguard, Alexandra Daddario running in slow-motion down a beach, and Dwayne Johnson as an other-worldy life-saving god. When they released the trailers, I was really intrigued by the tone that they were achieving, and then, before I knew it, I was watching Baywatch and even looking forward to it. Baywatch definitely strikes the right tone and balance between a cheesy 90s television show and a 2017 action-comedy. It pays homage to its roots and spends the entire run-time showing off the attractive cast, but at the same time, it pokes fun at all the ridiculousness of it, but then just runs with it, because hey, it’s entertaining. The women would always run in slo-mo, but the film would also call itself out on it every time. The plot gets completely far-fetched and implausible, but they clearly know that, there’s a tongue-in-cheek element to it whenever it goes past reality. Personally, I found that exhausting, but at the same time, I think the film handled it right. I love that Zac Efron has no problem playing pretty boy idiots and playing up that persona because he does it so well. He handles this type of comedy very well, portraying extreme characters like this with heart and humour and impeccable line delivery. Dwayne Johnson fits the character perfectly but did have some difficulty hitting the right tone with some of the lines (but seriously, who wouldn’t? this is cheesy writing on purpose). I do believe that Alexandra Daddario has more to offer than just her gorgeous looks and bikini body, but it’s not in this movie. Her character Summer is just a love interest, and the film struggled big time with how to round out her character. Kelly Rohrbach, on the other hand, was excellent as CJ. Her caring nature came off as sweet and very funny, and she maintained that even when the camera just wanted to look at her breasts in a bathing suit. Jon Bass was just there for comedic purposes, but he was funny. Hannibal Buress in limited screen time was great as both straight-man with hilarious lines and as a character that helps launch everything into the ridiculousness. Baywatch has its fair share of crass humour, but considering what the show and movie were sold on, it’s pretty fitting, and funny. You also have to be ready for the ridiculous action plot, but at the same it can be a fun and entertaining ride.